Around 97% of climate scientists express a belief that global warming is real. I’ve never understood the argument that this was all a conspiracy. I decided that both as a scientist and also as a member of humanity who currently resides on Earth, I owed it to myself to actually understand the “how?” in how global warming works. Turns out, the science is actually pretty simple. 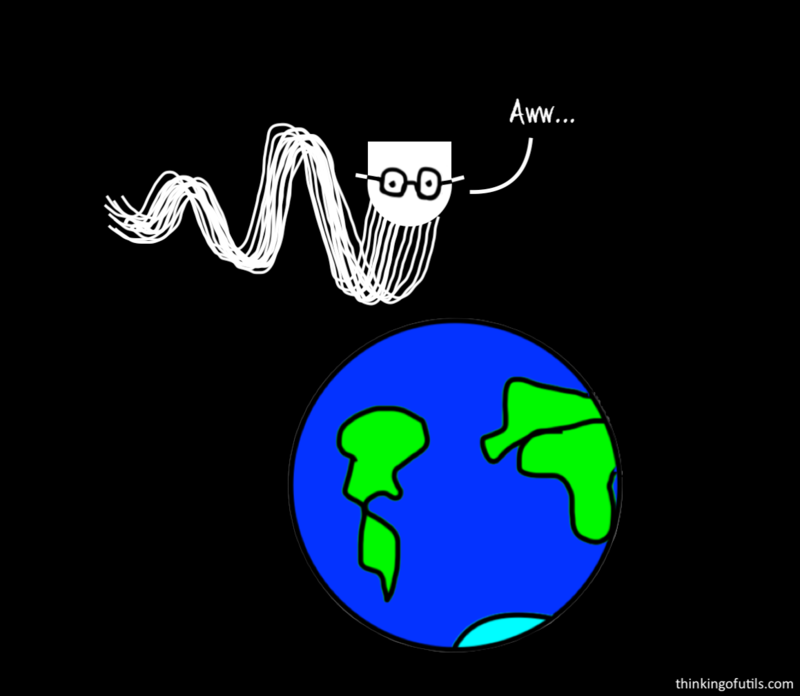 Let’s say hello to our friend, the good ‘ol electromagnetic wave. Light’s had a pretty interesting life. He was born in the sun, in a magical scientific process known as nuclear fusion. After leaving the sun, Light begins his travel through outer space. The overwhelming likelihood is that Light will leave the solar system without setting foot on any planet. But Light might get lucky and stumble into a planet. He might even reach our planet. Before Light can reach the surface of Earth, he has to make it past the atmosphere. You see, Light was born rich – with lots and lots of energy. And the atmosphere is made up of a bunch of greedy molecules that want to steal Light’s energy. 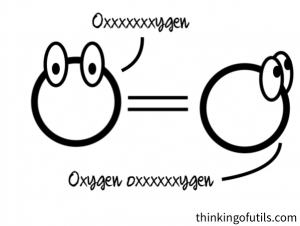 Two of the meanest and greediest molecules in the atmosphere are H2O and CO2 (water vapor and carbon dioxide). 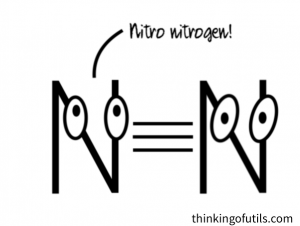 H2O and CO2 really want energy. But these two molecules are reverse-Robin-hood-ers – they usually steal from the poor, not the rich. Because of this, Light can usually pass right by H2O and CO2 without being disturbed. Light might “bounce off” of the Earth via reflection. If he hits a peaceful lake then this reflection will send Light in a predictable direction (as if he hit a mirror). If he hits a mountain then the reflection will be in a random direction. After Light is reflected, he leaves the surface of Earth with similar energy as when he appeared. After a short trip through the atmosphere, he’ll be on his way to space. Alternatively, the molecules in the Earth’s surface might absorb Light, killing him and stealing his energy. The Earth will use some of this energy to warm itself up. 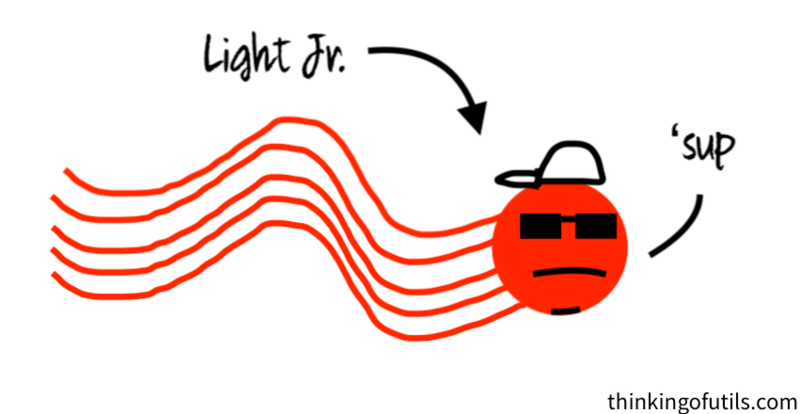 But it might use the rest of the energy to create another electromagnetic wave: Light Jr.
Light Jr. will therefore begin his trek with much less energy than Light had. After the attack, Light Jr. will be confused and head in a random direction. While before he was heading toward space, after he might head back to Earth. If Light Jr. is killed at the surface of Earth, even more energy will be taken. At this point Light III might try to leave Earth, but with even less energy than Light Jr. had. 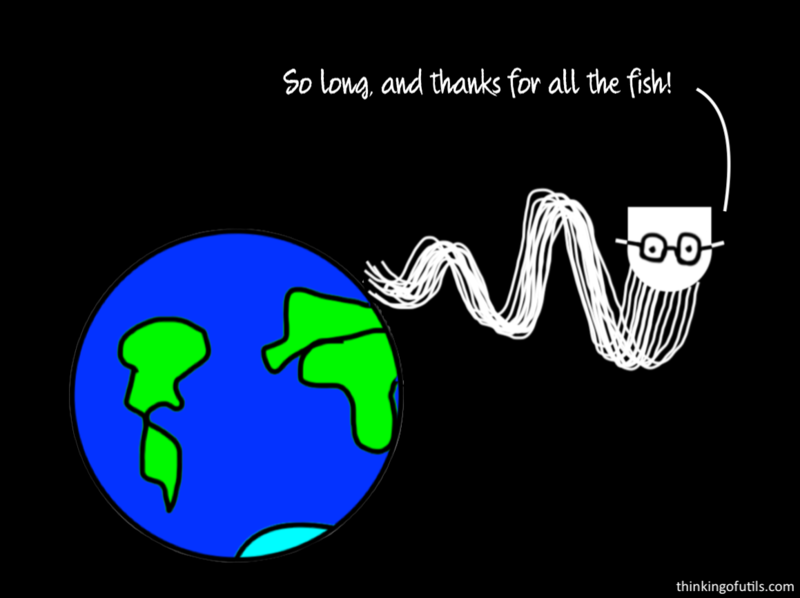 If the Earth is healthy, Light Jr. will still stand a good chance of escaping to space. But that all changes if there’s more CO2 in the atmosphere. Humans like to use electricity and to be warm. Electricity and warmth both require energy. The major way humans create this energy is by burning fossil fuels. Unfortunately, when fossil fuels are burned, CO2 is created. This process is called combustion. In fact, humans like burning fossil fuels so much, that the amount of CO2 in the atmosphere has increased by about 50% since the Industrial Revolution started. And that means that it’s harder for Light Jr. to escape from Earth than it would have been a couple hundred years ago (or even a couple of decades ago). As the amount of CO2 in the atmosphere has increased, more and more energy has been kept inside our atmosphere. 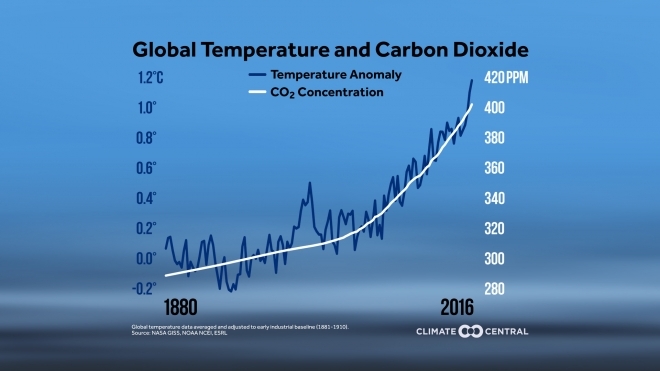 Predictably, this increase in CO2 has been matched with an increase in temperature of the Earth. And that’s more or less how global warming works. Sunlight is largely in the visible or near-infrared range – so it can generally pass through the CO2 and H2O in the atmosphere. The Earth absorbs sunlight and radiates lower energy infrared light. The lower energy infrared light is often absorbed by CO2 and H2O. As the level of CO2 rises, this lower energy infrared light has a harder time escaping the Earth, and the amount of energy trapped by our atmosphere increases, warming the planet. Current scientific models predict that if emissions continue to rise, Earth will warm by between 1.5°C to 4.5°C (2.7°F to 8.1°F) by 2100 (though many negative effects could be strongly felt far before then – perhaps as early as 2050). 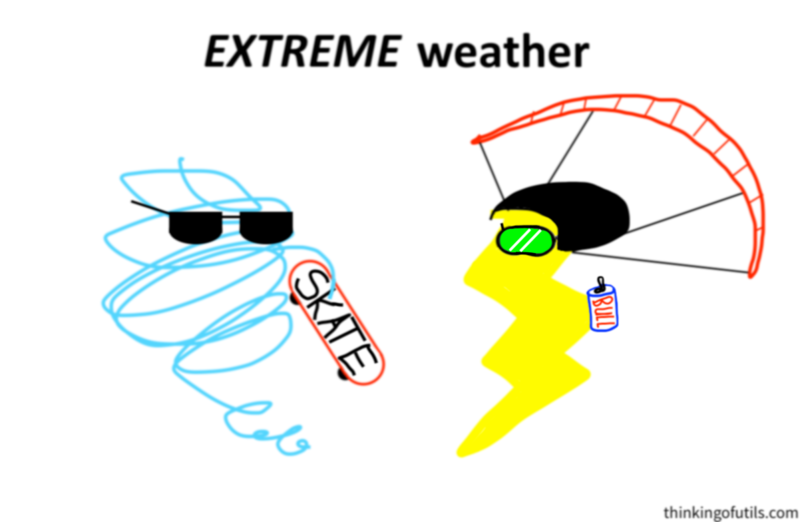 In addition to heat waves, global warming will also exacerbate other extreme weather – including hurricanes. Last year, several subsequent, intense hurricanes pummeled the Eastern US. Global warming may or may not have increased the destructiveness of these specific hurricanes (it’s unclear). But as global warming intensifies, hurricanes are expected to increase in their power (though the frequency of hurricanes won’t necessarily increase). There are a couple reasons that global warming tends to make hurricanes worse. First, warm ocean water is required to fuel hurricanes (hence why hurricanes tend to form in the tropics and break up over cooler water or land). As global warming increases the temperature of the ocean, the most powerful hurricanes will get even more powerful. Second, global warming will increase the sea level. As Earth’s temperature increases, the ice caps melt. When ice that’s on land or touching the bottom of the ocean melts, the sea level rises (this applies to much of the ice on Earth). 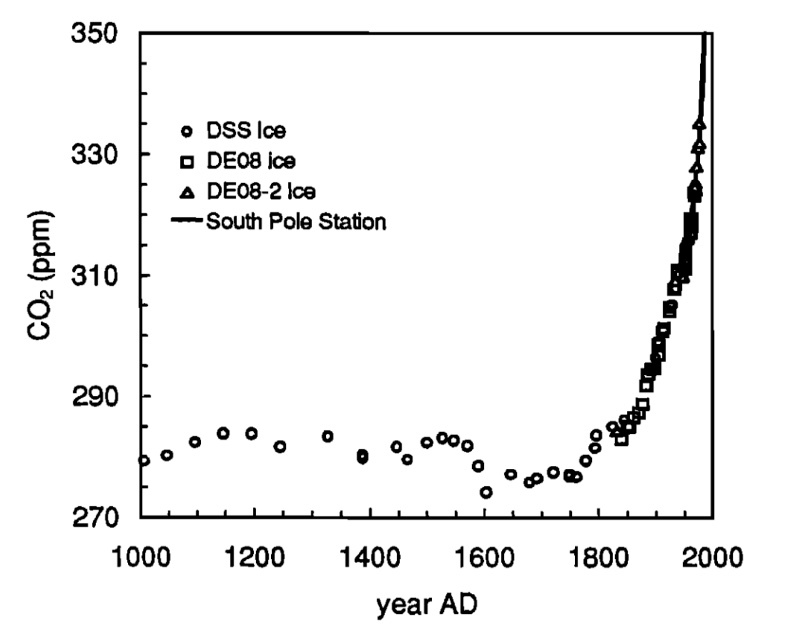 [On the other hand, when ice that’s floating melts, the sea level doesn’t change.] This is all very simple physics that you can test at home with a glass of water and some ice cubes. Additionally, as water heat up, it expands (very slightly) – further raising sea level. As the sea level rises, hurricanes can make it further inland before reducing in power. Remember what I just said about sea levels rising? That will flood coastal cities. 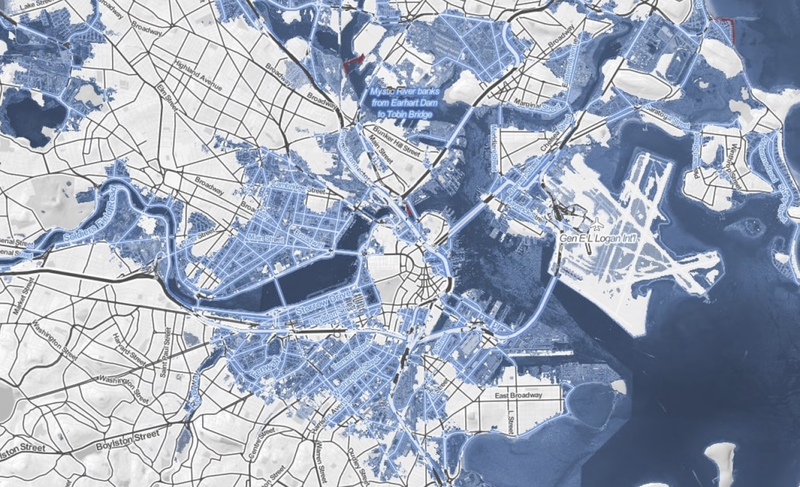 Most current models predict that sea levels will rise around 0.3 to 2.5 meters (1 to 8 feet) by 2100. Which doesn’t sound like a lot. But many cities are on coasts, near sea level. This makes sense, since coastal cities traditionally have operated as ports and also because people like to live near the ocean. The effects on food availability will likely be mixed. Yields will probably increase in more temperate regions, while decreasing in more tropical regions (plants like to be hot, but not too hot). It’s unclear if global yields will increase or decrease, but this uncertainty adds risk (which is bad). The effects on food accessibility, utilization, and systems stability will likely all be negative. Regional changes in yield could turn our food supply network on its head. Additionally, higher temperatures, more extreme weather, and flooding will likely harm these three factors. I’m a numbers guy, so I really looked for numbers on global warming’s expected impact on food security. Unfortunately, I wasn’t able to find anything reliable. Unlike climate models (for which we have millions of years of data and a general good sense of what’s going on), we really don’t seem to have a good idea about the magnitude of the effects global warming will have on food security. 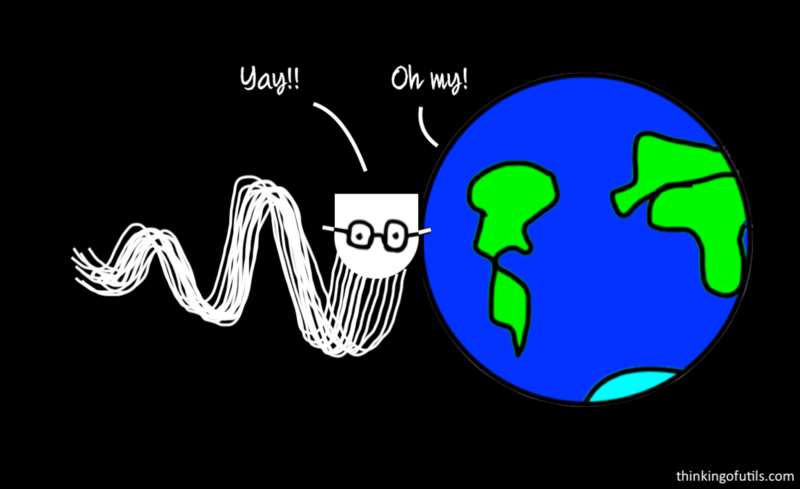 But our uncertainty with regards to magnitude here doesn’t mean there is nothing to worry about. Food security is important – that’s why FaAOotUN was created. It’s a really bad idea to take an important system like our food system and shake it up, simply hoping for the best. The above negative effects will likely cause a lot of people to migrate. Hurricanes could destroy communities. Oceanfront communities could be completely flooded. Farmers may need to move from the tropics to more temperate regions to find work. And no one wants to live in a place that has become too damn hot. So how many people will migrate in response to global warming? Estimates vary, with forecasts ranging from 25 million to 1 billion people displaced globally by 2050 (with 200 million being the most commonly cited figure). Note that those estimates are for displaced people, not for the number of migrants. Many would undoubtedly resettle within the same country and wouldn’t be forced to migrate, so the number of migrants would be lower. For comparison, there are 66 million people displaced today (to be consistent, again we’re talking about the total number displaced – the majority of these people are displaced within their home countries). Considering a particularly politically salient crisis, there are 13 million Syrians displaced by the current civil war in Syria – one million of which have migrated to Europe. The dark blue is the total number of displaced people in the world today. The red is the amount displaced from Syria. I’ve heard a lot about Syrian refugees in Europe – the debate about how many refugees to let in seems to be giving Europe an existential crisis. The number of these refugees is represented by the green, which hardly registers on the graph. Okay, now let’s move on to the projections for global warming in 2050. The purple is the low estimate. The light blue (cyan?) is the mode estimate (I swear that’s the only time I’ve ever used that word since learning it in middle school pre-algebra). And the orange is the high estimate. Looking at this graph, I find it hard to remind myself that the red represents one of the worst humanitarian disasters in the world right now. Hopefully we get “lucky” and wind up in the purple situation with “only” 25 million people displaced by global warming. Of course, that’s still a catastrophe representing significant human suffering. But global warming might decide to be a jerk and give us the cyan or orange situation with 200 million or a billion people displaced. That would imply mass migrations on a scale we’ve never seen before. What effects would that have on institutions, economies, the spread of disease, and violence of all kinds – from territorial disputes to terrorism? In a word: bad. That’s why the US military (not generally regarded as a bunch of tree hugging hippies) considers global warming to be a serious “threat multiplier” with the potential to jeopardize our national security. Remember also, these estimates are for 2050. 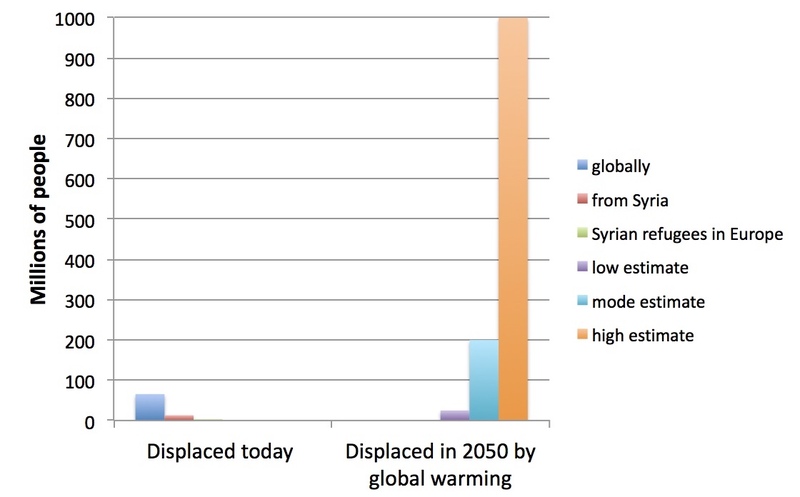 By 2100, the situation could deteriorate further. From what I can tell, mass migrations represent the most likely way global warming could threaten global stability. Our best bet for avoiding the worst of global warming is to transition away from fossil fuels and toward other energy sources. Nuclear, wind, and solar are the most cited possibilities. 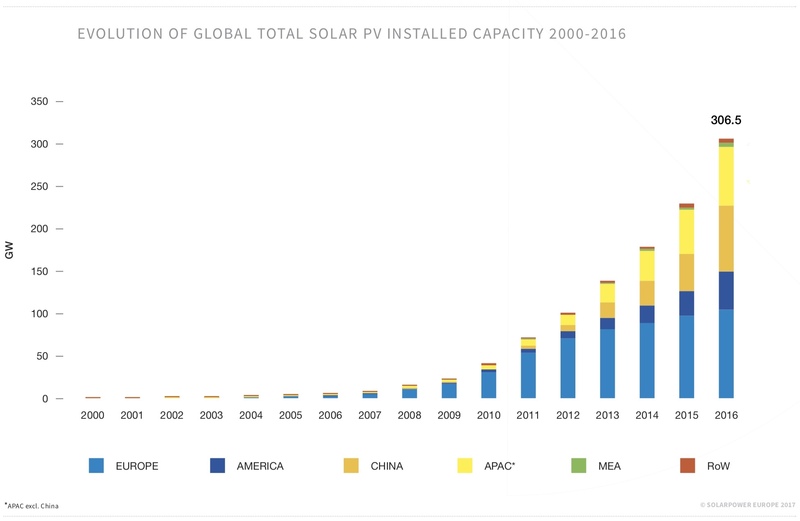 Most experts agree that for economic, scientific, and political reasons, solar holds the most promise. Which begs the question: can this growth continue? And if so, what happens? 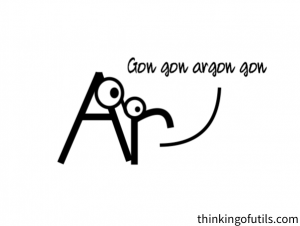 Very good post! Educational and fun!